Rabies is a viral disease that affects the nerves and brain. It is transmitted from animals to humans. It is 100% fatal once symptoms appear. Which animals can get rabies? Any mammal can get rabies, although it mostly affects carnivores (meat-eaters) and bats. Dogs are responsible for 96% of human rabies cases in South-East Asia, but there are also reports of human rabies due to bites of cats, mongooses, jackals, foxes, wolves and other carnivorous animals. Rabies due to monkey and rat bites are rare. Horses and donkeys get aggressive and bite ferociously when they are rabid. Cattle and buffaloes do not bite when they are rabid, but precautions should be taken while examining sick animals that are salivating. There are two different presentations of rabies in animals – the “furious” form and “dumb” or “paralytic” rabies. Furious rabies is the classic “mad-dog” syndrome, although it occurs in other animals as well as dogs. Animals will viciously attack using teeth, claws, horns, or hooves at the slightest provocation. Such animals lose fear of people and other animals. Previously shy puppies may seek human companionship and are overly playful, but bite even when petted, usually becoming vicious in a few hours. Paralysis and death follow within a few days. Paralytic rabies initially presents as in-coordination and profuse salivation. Dropping of the lower jaw is common in dogs. These animals may not be vicious and rarely attempt to bite. The paralysis progresses rapidly to all parts of the body, and coma and death follow in a few hours. How do humans catch rabies from animals? Rabies is transmitted by the saliva of infected animals, usually when an infected animal bites or scratches a person. It can also be transmitted by an infected animal licking a cut or graze, or even the inside of the mouth of nose. Rabies is not transmitted by consuming cooked meat or milk from infected animals. How long does it take to develop rabies after you have been exposed? It can take as little as a few days or up to a year for the symptoms of rabies to develop, this time period is referred to as the incubation period. It depends on several factors including the severity of the bite and the location of the bite. Bites that are close to the head or in areas with a lot of nerve endings (e.g. fingertips) tend to have a shorter incubation period as it takes less time for the virus to reach the brain. The doctor will decide what further steps need to be taken, depending on your current vaccination status, the vaccination status of the animal, and the severity of the bite/scratch. It may include a course of rabies vaccinations over several weeks and infiltration of rabies immunoglobulin (pre-formed rabies antibodies) around the site of the bite wound. It is very important that you follow the doctors instructions exactly and return on the correct dates for the vaccinations advised. Is there any treatment for rabies? Once symptoms of rabies have developed, there is no treatment. 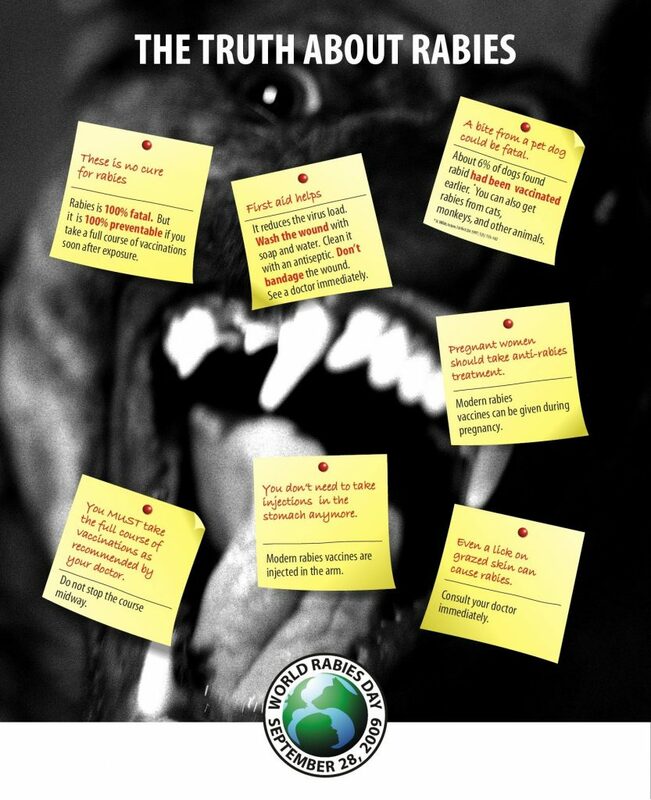 Rabies is 100% fatal to animals and humans. Effective vaccinations against rabies are available for both humans and animals. Anyone considered to be at a high-risk for rabies exposure (such as animal health workers) should be vaccinated as a preventative measure. Vaccination of stray dogs is the most effective method for reduction of human rabies cases.